I know you think all I'm doing this month is eat and drink and hang around with sphinxes and putti. Not so! I also hang around with abandoned motorbikes! I'm trying out some cool new Daniel Smith watercolors, such as Blue Ochre, which I used for the underpainting here. All in trying to get ready for sketching in Paris! Of course, I have to practice drinking wine before I go, too. 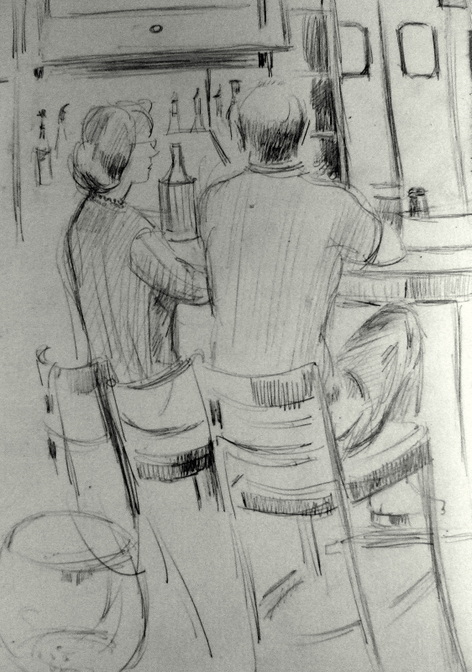 This nice couple were at the bar just long enough for me to sketch in the basics. Then, the hostess called them to their table and they were gone. nice sketch, reminds me of an old 1940's cartoonist who did a strip called Side Glances. Well done. You are so versatile! 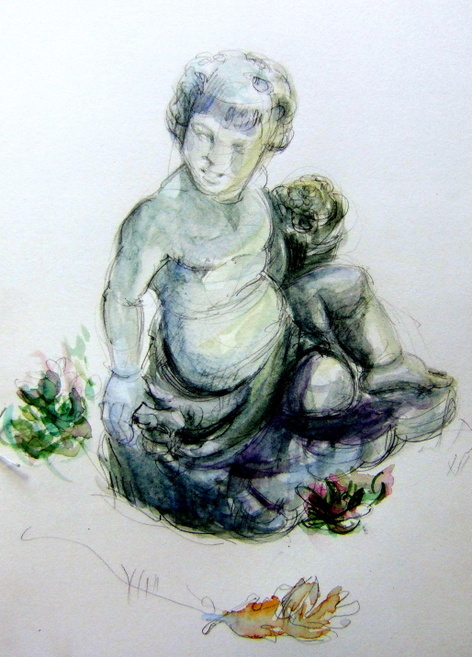 The cherub is so powerfully done, wonderful value range and depth and the composition is great with the little flourishes of color and decoration in the foreground. It's all so active and colorful and vibrant. And then the waiting diner sketch is just the opposite, has a very cool and quiet feel, even though loosely drawn. Wonderful! Preparing the holidays and the travels is already a big fun! What great comments! I don't know whether I'm breathless from the images of myself on motorbike, one arm around Cupid, the other around a magnum of Dom Perignon, sailing over the Atlantic to Paris... or because I just realized HOW MUCH I have still to do before I go! Yikes! (Btw, I am hoping to be able to post there as I have on my other trips.) On another topic: Typepad won't let me post images today for some reason--- hope this isn't setting a precedent for Paris!